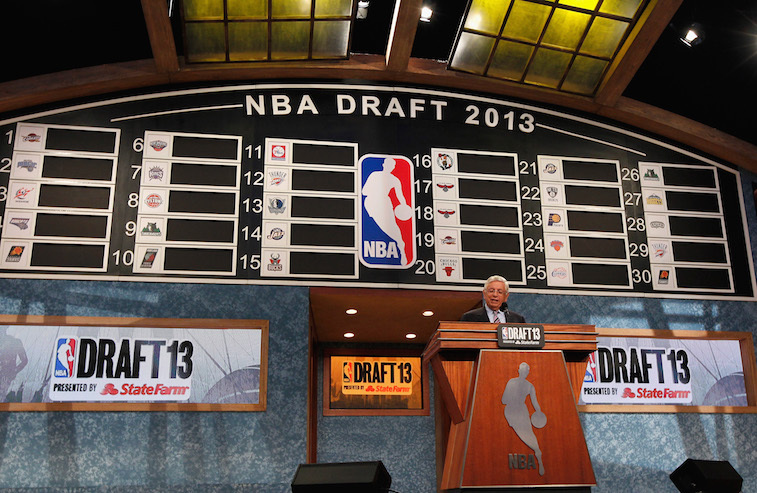 The 2015 NBA Draft is upon us and in just a few hours, the lives of some of the most talented basketball prospects in the world will be changed forever. But until their fates are revealed, we’re going to continue to play our small part in the process by attempting to predict where they’ll end up. We’ve done our best so far to play the guessing game. We laid out our post-lottery predictions. 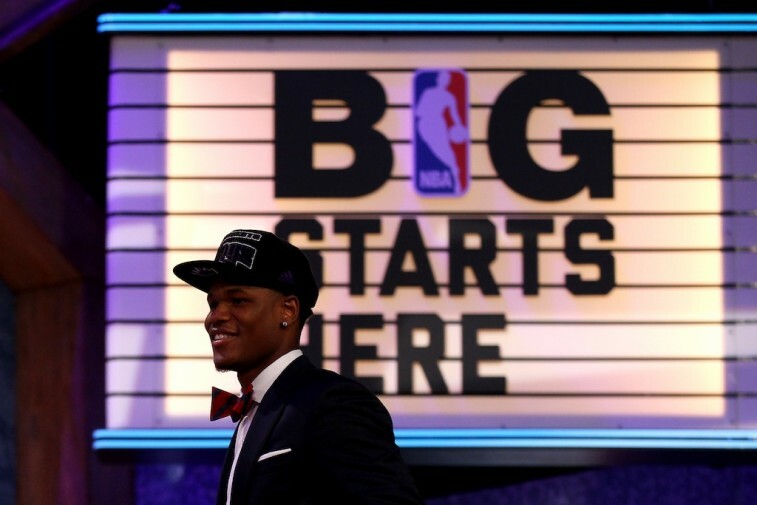 We followed that up by seeing what would happen if the Minnesota Timberwolves went off script with their first overall selection. We broke down international prospects, compared coveted big men, and did all we could do keep you informed. And we’re not done yet. The draft may be on the horizon, but there’s still enough time for us to provide one last hypothesis on how this whole thing will play out. 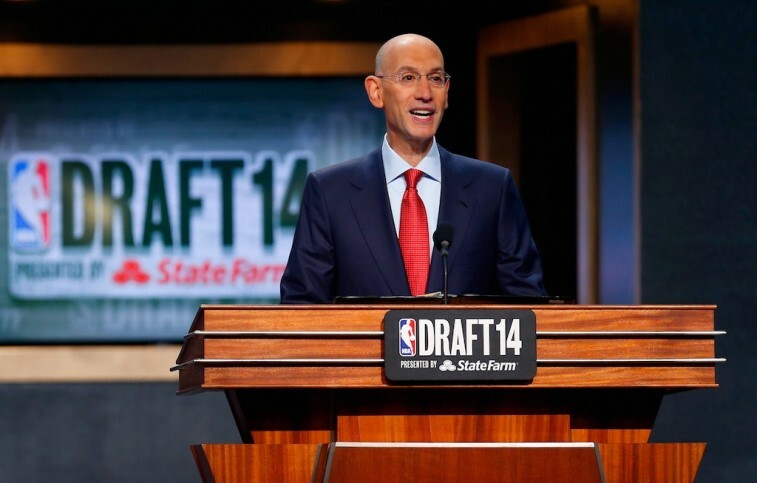 With that, we give you our 2015 NBA Mock Draft: Final Edition. The Minnesota Timberwolves stay true to their word and select Karl-Anthony Towns with the No. 1 overall pick. The Kentucky freshman needs to refine his offensive game, but he brings the most upside in the entire draft. He’s a two-way center and a dominant force on the defensive end. By adding him to a young core that already features last year’s rookie of the year Andrew Wiggins and high-flyer Zach LaVine, it’s clear the Timberwolves are heading in the right direction. The Los Angeles Lakers decide to go big by taking Duke’s Jahlil Okafor. The 6-foot-11 center has the most polished offensive game for a player of his position in years. With his soft touch around the rim, impeccable footwork, and unrivaled back-to-the-basket skill, the Lakers may have just found the organization’s next great center. Despite the love that Sam Hinkie was reportedly throwing Kristaps Porzingis’ way, D’Angelo Russell’s recent workout was too good to overlook. The lefty from Ohio State “killed it” and Philadelphia was more than happy to bring him into the fold. Not only are the Sixers in desperate need of a floor general, but with Russell’s vision, IQ, handle, confidence, and smooth shooting, he could very well end up as the best player in this draft class. The New York Knicks were hoping that either Towns, Okafor, or Russell would fall to them at No. 4. Unfortunately, that didn’t happen. Yet, after getting a private look at Kristaps Porzingis, Phil Jackson sees the beauty — and rarity — in a 7-foot-2 player who’s athletic enough to hit the three and protect the rim. Knicks fans may not love the pick right away, but once they get a good look at the 19-year-old Latvian, we have a feeling they’ll be singing a different tune soon enough. The Orlando Magic had been all about Porzingis, but the Knickerbockers beat them to the punch. But it’s not like they’d be settling by selecting Mario Hezonja. The 6-foot-8 shooting guard is crafty, athletic, and a talented three-point shooter. On top of those traits, he’ll bring some much needed swagger to this organization. Take a look for yourselves to see what we’re talking about. In our final mock draft, Emmanuel Mudiay stays with the Sacramento Kings and George Karl gets an athletic point guard who’s more than capable of running his up-tempo offense. Mudiay is already super skilled at getting to the rim. If he learns to knock down shots on a more consistent basis, then the Kings will have gotten a major steal at No. 6. The Denver Nuggets need a talented wing. Justice Winslow fits the bill. He has an NBA-body, insane athleticism, and can knock down the three. His high motor, explosiveness, and defensive tenacity will be much appreciated by new head coach Mike Malone. A new era in Denver has officially begun. This time around, Stanley Johnson gets picked one position higher. The Detroit Pistons need help at the small forward position and Johnson can be that guy. He’s a versatile wing who is talented on both ends of the floor. In his lone season at Arizona, Johnson averaged 13.8 points and 6.5 rebounds and showcased NBA-quality stuff. Despite all his athleticism, Johnson still has plenty of room to get better. This would be a good get for the Pistons. The Charlotte Hornets were an awful outside-shooting team last season. By selecting Kentucky’s Devin Booker, they instantly get better in that respect. In his only season under John Calipari, the 6-foot-6 guard shot 41.1% from three-point range and finished with an overall field goal percentage of 47%. Michael Jordan will be excited to add a true shooter to the organization. Frank Kaminsky stays put in the No. 10 spot. The Miami Heat will love his winning mindset and the fact that he can come in and contribute right away. The 7-foot-1 center out of Wisconsin shot 41.6% from three-point land this past season. The Heat will excited to incorporate another big who has the ability to stretch the floor. 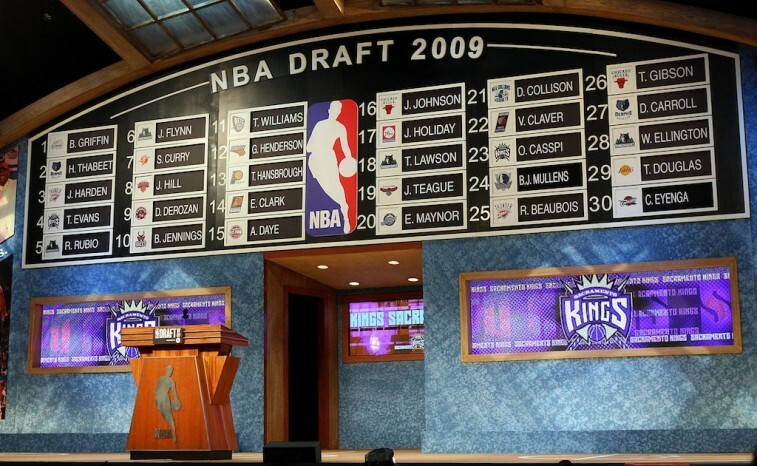 This wasn’t how our last mock played out, but we have a feeling if Willie Cauley-Stein is still on the board at No. 11, Larry Bird won’t be able to pass on the draft’s top rim protector. After all, the legend wasn’t shy about his feelings on the 7-foot-1 center. The Pacers are going to need a new foundational piece in the middle and Cauley-Stein will be the perfect anchor for years to come. With Cauley-Stein off the board, the Utah Jazz turn their attention to another quality big man: Myles Turner. While he is far from a finished product, there is a lot to like about the 6-foot-11, 240-pound center-power forward. In his one season at Texas, Turner averaged 10.1 points and 6.5 boards. He’s got great hands, can face up and knock down the jumper, and is lethal off the pick and pop. Just wait until he realizes his true potential. The Jazz will have themselves a gamer. With the No. 13 pick in the draft, the Phoenix Suns decide to draft for potential by selecting Kansas freshman Kelly Oubre. The kid has a 7-foot-2 wingspan and sports crazy athleticism. If the Suns don’t rush him and are prepared to let him develop, then Oubre has the makings of a star in the National Basketball Association. The Oklahoma City Thunder have liked Murray State’s Cameron Payne for quite some time. With his combination of quickness, intelligence, and ability to attack the rim, the Thunder believe he could be a great long-term backup for Russell Westbrook. They’d be absolutely thrilled if he’s still on the board at the bottom of the lottery. The Atlanta Hawks could use another play at the four, which is why we have Trey Lyles remaining in this spot. The 6-foot-10 freshman is talented, versatile, and has a high basketball IQ. Throw in the fact that he has a 7-foot-4 wingspan, and we’re sure Mike Budenholzer will figure out a way to make good use of Lyles’ skills. The consensus is that Boston really wants to move up in this draft. Since we don’t do that here, the Celtics remain at No. 16 and so does Bobby Portis. The Second-Team All-American from Arkansas averaged 17.5 points, 8.9 rebounds, and 1.4 blocks per game last season. If you combine those stats with his explosiveness and high motor, we believe Brad Stevens will be plenty happy with this pick. The Bucks goes with UCLA power forward Kevon Looney. In his only season for the Bruins, Looney averaged 11.6 points and 9.2 rebounds. He needs to refine his game, but his upside is undeniable. It also doesn’t hurt that he’s versatile and has the length that most organization’s crave. We caved. While Tyus Jones doesn’t have the ideal size for a point guard in today’s game, he’s everything you could want in a floor general. He’s controlled, confident, and unfazed by the big stage. His intangibles are off the charts — Daryl Morey‘s knows this — and he is a consistent winner. Houston would be lucky to add the former Dukie into the mix. We’re not sure that Sam Dekker will actually fall this far in the draft, but in our mock he does, and that works well for the Washington Wizards. Dekker is athletic and tough and capable of getting on a hot streak. He needs to become a more consistent shooter. That much is obvious. However, his confidence and ability to get to the rim are attractive qualities and could make him successful at the next level. Different mock draft, same story for the Arizona small forward. 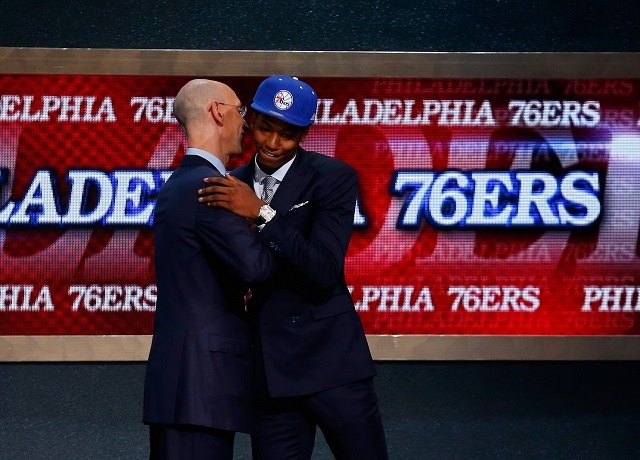 Rondae Hollis-Jefferson has the NBA-ready body and the skills to contribute defensively right away. This is something the Toronto Raptors desperate need. Essentially the Houston Rockets and Dallas Mavericks swapped point guards. This time around, Notre Dame’s Jerian Grant ends up with the Mavs. He may be older than Jones, but his experience cannot be overlooked. He is also smart, gritty, and 6-foot-4. Grant should fit in better than Rajon Rondo ever did. No matter how it plays out, the Chicago Bulls will still be in the market for a backup point guard. Therefore, Utah’s 6-foot-5 point guard Delon Wright is staying put at No. 22. He’s not going to wow you with flash, but Wright is a quality decision maker. That attribute will pay dividends in Chicago. We can’t see the Portland Trail Blazers passing on Georgia State’s R.J. Hunter. The guy is smart, lethal from the outside, and a skilled passer. This would be a nice fit for both player and organization. We’re sticking with the guy who can space the floor and knock down shots for LeBron James. Virginia’s Justin Anderson is versatile and smart and averaged 12.2 points per game and shot 45.2% from three before getting injured toward the end of last season. 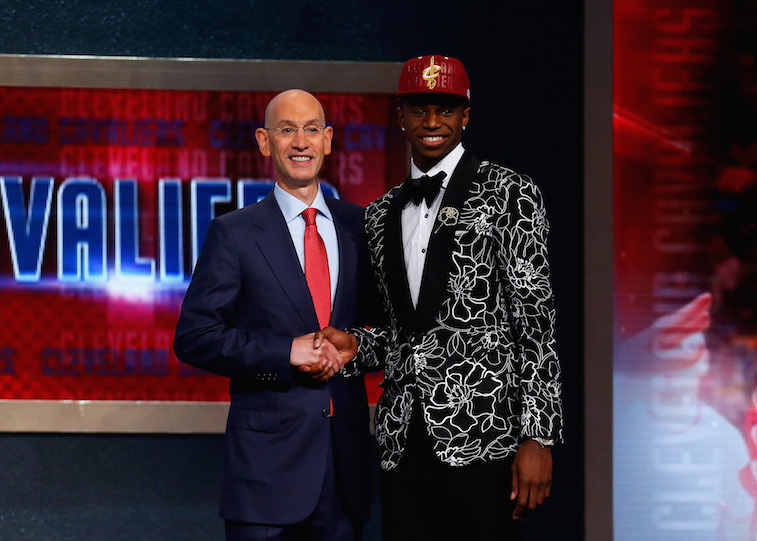 If all goes well with his recovery, the 6-foot-6 small forward could be a great addition to the Cleveland Cavaliers. UNLV’s Christian Wood is the kind of athletic power forward that makes sense for the Memphis Grizzlies. He can really get after it on the rebounding front and has great defensive instincts. With enough time to develop and once his body fills out, Wood has the potential to be of great value for the Grizzlies. This pick just feels right. Louisville’s Montrezl Harrell is undersized (6-foot-8), but he makes up for it with his tenacity and fearless play. The motor is there and he’s plenty strong. If the San Antonio Spurs rolls the dice on him, and he buys into their system, this could be a win-win for everyone. In Terry Rozier, the Los Angeles Lakers add another scorer to the roster. The Louisville Cardinals guard is slick and has an affinity for making huge plays. He’s quick, explosive, and can score off the dribble. He’s not much a distributor, but his scoring prowess will work to his advantage in the NBA. The Boston Celtics could make good use of LSU power forward Jarell Martin. Despite being a bit of a tweener, he showed plenty of versatility during his two years with the Tigers. He make great strides in everything from scoring and rebounding, to steals and free throw percentage. He would be a nice addition to the Celtics front court. The Brooklyn Nets take a chance on Syracuse’s Chris McCullogh. The ACL injury he suffered back in January should keep him off the floor for most of the upcoming season. However, his length, defensive skills, and overall potential should make him worth the risk at No. 29. If Rashad Vaughn falls this far, the Golden State Warriors should jump on him. The Dubs like shooters and UNLV product is just that. Last season, the 6-foot-6 shooting guard put up 17.8 points per game and connected on 38.3% of his threes. We think he has the potential to be a fan favorite at Oracle Arena.